Concerns about a slowing global economy have persisted for a number of months now, and while U.S. stocks have risen nicely through most of the year, in the last month or so their rally from a pre-Christmas low has seemingly been capped by persistent concerns about the slowing global economy. Indeed, it seems that the effect of slowing growth in Europe, China, and other parts of the world are finally starting to be seen in the United States. As we get ready to start a new slate of earnings announcements, I’m seeing some increasing speculation among analysts that corporate earnings, which have been a catalyst for the market to this early point in the year, may come in below previously growth forecasts. Most investors and analysts have been using progress on the trade front as another justification to push the market higher; but earlier yesterday the Trump administration threatened an increase of $11 billion in tariffs against Europe in retaliation for favorable bids to Airbus in the wake of temporary, but apparently longer-than-expected groundings of the Boeing 737 Max airplane around the world. And so the anxiety wheel keeps turning. If these newly pessimistic forecasts are correct, the market could be in for rough seas ahead; but even if they are proven wrong, it’s usually smart to make sure that stocks with a conservative, defensive-oriented profile make up a part of your portfolio. Aerospace & Defense is a sector of the market that generally performs well, even in difficult economic and market conditions, in large part because of the stability of its revenues, which by and large come from government contracts. Raytheon Company (RTN) is the fifth-largest military contractor in the world, with revenues generated not only from sales in the U.S. but also to parts of Asia and the Middle East. As I think you’ll see, this is a company that operates with a conservative management approach. Does their value proposition make them a stock you should consider taking a position in? Take a look and decide for yourself. Raytheon Company is a technology company, which specializes in defense and other government markets. The Company develops integrated products, services and solutions in various markets, including sensing; effects; command, control, communications, computers, cyber and intelligence; mission support, and cybersecurity. The Company operates through five segments: Integrated Defense Systems (IDS); Intelligence, Information and Services (IIS); Missile Systems (MS); Space and Airborne Systems (SAS), and Forcepoint. The IDS segment develops and produces sensors and mission systems. The IIS segment provides a range of technical and professional services to intelligence, defense, federal and commercial customers. The MS segment is a developer, integrator and producer of missile and combat systems. The SAS segment is engaged in the design, development and manufacture of integrated sensor and communication systems for missions. The Forcepoint segment develops cybersecurity products. RTN has a current market cap of about $50.5 billion. Earnings and Sales Growth: Over the last twelve months, earnings increased by 44%, while revenue also increased by 8.5%. In the last quarter, earnings growth was about 30%, while sales growth was a little above 8%. RTN operates with a healthy margin profile; over the last twelve months, Net Income was 10.75% of Revenues, and increased somewhat to 11.3% in the last quarter. Both measurements are a good sign of strength. Free Cash Flow: Over the last twelve months, RTN had $2.66 billion million in Free Cash Flow. That’s adequate and translates to a Free Cash Flow Yield of a little over 5%. Debt/Equity: RTN’s debt to equity ratio is .41, which is pretty low and suggests that management follows a conservative approach to debt. Their balance sheet shows about $3.6 billion in cash and liquid assets against roughly $4.75 billion in long-term debt. The margin profile is a good indication that servicing their debt is no problem, and their solid cash position suggests RTN has healthy liquidity as well. Dividend: RTN’s dividend is $3.77 per share and translates to an annual yield of 2.1% at the stock’s current price. Price/Book Ratio: there are a lot of ways to measure how much a stock should be worth; but one of the simplest methods that I like uses the stock’s Book Value, which for RTN is $40.31 and translates to a Price/Book ratio of 4.44 at the stock’s current price. The stock’s historical average Price/Book ratio is 4.26, meaning that the stock is currently overvalued, by about -4%. That’s a little deflating; however a counter to that forecast is the added reality that the stock is currently trading almost 35% below its historical Price/Cash Flow ratio, which provides a more attractive target price at around $242 per share. Current Price Action/Trends and Pivots: The red diagonal line measures the length of the stock’s downward trend from around $230 a year ago, until the end of December when it bottomed around $144; it also informs the Fibonacci trend retracement lines shown on the right side of the chart. The stock has rallied more than 24% from that low point to about $187, marked by the 50% Fibonacci retracement line. From that point, the stock has consolidated over the last month in a fairly narrow range, with support and around the 38.2% Fibonacci line at $177 and resistance at the $187 mark. The stock’s next significant move will be determined by which side of that consolidation range it breaks through; a push above $187 should give the stock near-term momentum at least to the 61.8% retracement line at $197, and possibly to as high as $210, at the stock’s December high point. A break below $177, however could see the stock drop to as low as $163, based on pivot points set in late October and again in early December. Near-term Keys: Whether or not the stock marks a good value right now really depends on whether you prefer to work with the stock’s Price/Book or Price/Cash Flow ratio; I normally prefer to see both number offering some agreement, to at least show an undervalued state in both cases. It is also true, however, that one of the silver linings for defense and military contractors, despite trade tensions is increased defense spending by the Trump administration and other countries around the world. That could shift the value argument more strongly to favor Price/Cash Flow as the more useful measurement in this case. 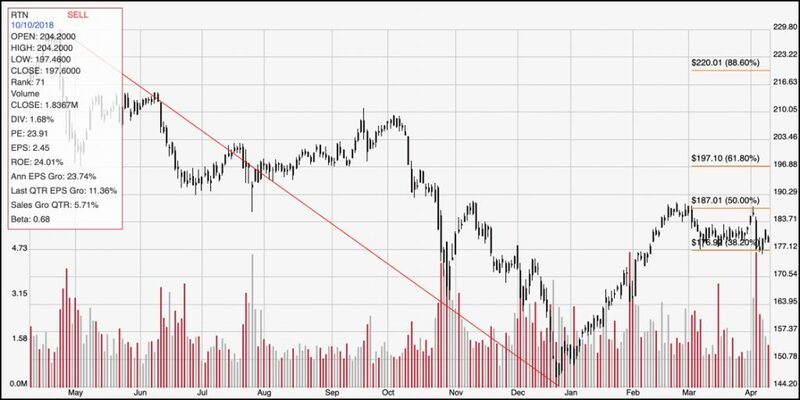 If you prefer to work with a short-term, momentum-based trade, look for a break out of the stock’s current consolidation range before you do anything. Use a break above $187 as a signal for a bullish trade with call options or buying the stock outright, and a push below $177 for a bearish signal to short the stock or start buying put options.